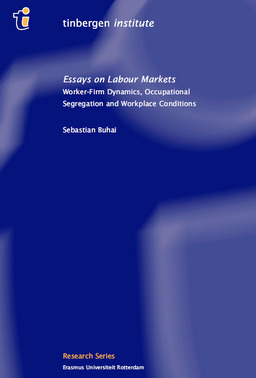 The main chapters of this book, “Essays on Labour Markets”, focus on analyzing the dynamics of the employment relationship between workers and firms (chapters 2 and 3), modelling occupational segregation and labour market inequalities between social groups (chapter 4) and characterizing the link between a firm’s health & safety work conditions and its financial performance (chapter 5). Each essay contributes with original insights often using innovative and uncommon techniques, such as real options theory applied to wage-tenure profile analysis, social network analysis of occupational segregation, or estimation of firm production functions augmented with workplace environment indicators. Particularly intriguing conclusions of this thesis include: the effect of the selectivity on the worker’s outside option explains the largest part of the observed wage-tenure profiles; at least part of the wage return to “tenure” is in fact a wage return to “s! eniority”, i.e. the worker’s position in the tenure hierarchy of her firm; if informal contacts are relevant in job search, occupational segregation is the optimal social welfare policy for social groups with homophilous preferences; improving certain physical dimensions of the workplace health & safety environment raises a firm’s productivity, whereas other dimensions do not appear to matter in this regard.